Zao Wou Ki was born in Beijing on 13 February 1921. He died on 9 April 2013 at his home in Nyon Switzerland. Later after arriving in France, he will adopt the spelling ZAO for his name. 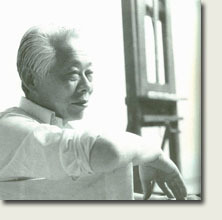 In 1942, he organises an exhibition of works by Wu Dayu, his teacher, together with some of his own works. Zao Wou Ki goes to France and reaches Paris April the 1st and spends the whole afternoon in the Louvre. He attends the Academie de la Grande Chaumiere and lives Rue du Moulin Vert nearby Alberto Giacometti's studio. He makes the acquaintance of Hans Hartung, Nicolas de Stael, Pierre Soulages, Viera da Silva, Sam Francis, Norman Bluhm and Jean-Paul Riopelle. They often gather at the Galerie Nina Dausset, rue du Dragon. In May 1949 he has first exhibition at the Galerie Creuze. He receives encouragement from Miro, Giacometti and Picasso. At the Desjobert printing shop he discovers and learns the technique of lithography. Inspired by his lithographs, the writer Henri Michaux, spontaneously produces eight poems. The volume is published with the title Lecture de huit lithographies de Zao Wou Ki and exhibited at the galerie La Hune in 1950. This marks the start of an uninterrupted friendship between Zao Wou Ki and Henri Michaux. In Bern (Switzerland) Zao is mesmerised by the paintings of Paul Klee. In connection with Zao's participation to the International Biennial of Colour Lithography in Cincinnati, a full-page, reproduction of one of his lithographs, is published in Life magazine. First monograph written by Claude Roy and published by Le Musee de Poche. First exhibition at the Kootz Gallery in New York. Samuel Kootz becomes his first regular dealer in the United States. Solo exhibition at the Kootz Gallery in New York and at the Tokyo Gallery in Tokyo. In 1962 exhibitions in Madrid, at the Ateneo, and then in Cordoba, at the Galeria Liceo. Retrospective in Essen, Germany, at the Folkwang Museum, paintings between 1950 and 1964. Exhibitions in Europe: in Vienna at the Graphische Sammlung Albertina, in Turin, Oslo. Exhibition at the Galerie de France in Paris, with a foreword by Pierre Schneider. In 1969 second retrospective exhibition at the contemporary art museum in Montreal and then at Musee du Quebec. Exhibition at the Sommerakademie fur Bildende Kunst in Salzburg. Exhibitions in Geneva, Charleroi, and at the Galerie de France. The Galerie de France exhibits his recent works, with a foreword by Rene Char. In Accrochages III, an exhibition at Centre Georges Pompidou, an entire room is devoted to his work. Exhibitions in France, Belgium, and Lebanon. Exhibitions in Barcelona and at the FIAC - the contemporary art fair - in Paris, with the Galerie de France. Pierre Matisse exhibits his paintings and inks in New York. I.M Pei writes the foreword of the catalogue. Publication of Zao Wou Ki, Encres, a dialogue between the artist and Francoise Marquet, with a foreword by Henri Michaux. Exhibition at the Galeries Nationales du Grand Palais in Paris. The catalogue is introduced by Jean Leymarie and Francois Cheng. The exhibition travels to five destinations in Japan. At the request of I. M Pei, Zao creates two large pictures in ink Fragrant Hills Hotel. Exhibition in Taiwan at the National Museum of History. Retrospective at the Musee Ingres. Invitation to exhibit by China's Minister of Culture. A selection of works is presented at the National Museum in Beijing and in the facilities of his former school in Hangzhou. Exhibition at Jan Krugier Gallery in Geneva. Exhibitions at Musee des Beaux-Arts in Tours, at the Vasarely Foundation in Aix, at the Artcurial Gallery, foreword by Pierre Daix. Retrospective at the Gulbenkian foundation in Lisbon. Exhibitions in Luxembourg: Encres de Chine at the Musee National and Peintures at the Chateau de Vianden. Exhibitions in Germany, Switzerland, France. Zao is made a Commandeur de la Legion d'Honneur, receives The Grande Medaille Vermeil de la Ville de Paris and is awarded an honorary doctorate by the University of Hong Kong. Retrospective exhibition at the Taipei Fine Arts Museum. Exhibition at the Centro Cultural de Arte Contemporaneo in Mexico, catalogue introduced by Robert Littman and Pierre Schneider. Zao Wou Ki receives the Imperial award from Emperor Akihito and Empress Michiko. Illustrations of 24 Sonnets of Shakespeare. Publication of a monograph by Pierre Daix, Zao Wou Ki, l'Oeuvre 1935-1993. Seven prints for Henri Michaux's book Annonciation. Retrospective at the Kaohsiung Museum of Fine Arts in Taiwan and at the Museum of Fine Arts in Hong Kong. Daniel Marchesseau curates both exhibitions. Design for a ceramic mural panel for the future Atlantic underground station in Lisbon. At the FIAC with the Jan Krugier Gallery. Exhibition in New York, Hommage a Pierre Matisse at the Jan Krugier Gallery, texts by Maria Gaetana Matisse and I. M. Pei. The exhibition then travels to the Krugier-Ditelsheim Gallery in Geneva. Participation in ARCO 1998, the international fair in Madrid. Retrospective travelling in China: at the Shanghai Museum of Art, in Beijing at the Chinese Palace of Fine Arts, in Canton at the Palace of Fine Arts. Daniel Marchesseau curates these exhibitions. Exhibitions in Taiwan, France and Japan. Publication of Grands formats, participates in Chine, la gloire des empereurs, at the Musee du Petit Palais. In the spring of 2001 exhibition at the IVAM, in Valencia, Spain. Exhibition " Signe(s) " , inks of Henri Michaux and Zao Wou Ki. Exhibition "Zao Wou-Ki, Reve de nature ", at the Chenonceau castle . Inks and oils of the last twenty years. In December , Zao Wou Ki is elected at the Academie des Beaux Arts. The Academie des Beaux-Arts is the section of the Academie Francaise reserved to painters and architects. His official reception at the Academie is on schedule for November 2003. In Helsinki, Taidehalli, " retrospective Zao Wou-Ki"
Exhibition at the Marlbourough Gallery, New York.